Giving seeds a pep talk doesn’t work. A few weeks ago we celebrated Trinity Sunday. God being one God and three persons is one of the great mysteries of the Christian faith, but not the only one. How does the Son of God assume a human nature into Himself? Jesus is not half God and half man, but fully God and fully man. Through this humanity, God is able to experience death – even death on the cross. Through this divinity, the human Son is able to give us His body and blood in the Sacrament, no matter where we are. How does this work? We don’t know. I suspect that even if God told us how it is done, we still wouldn’t understand. It’s a mystery. Consider some of the mysteries of the Holy Spirit. How does the Holy Spirit take a rebellious, sinful human being and work faith in the heart? People balk at the idea that babies can have faith, but, in fact, faith in Jesus Christ at any age is a miracle of the Holy Spirit. Given that an adult has had many years to build up a defense against the Holy Spirit, the miracle of conversion may be greater in an adult than it is in an infant. Mysteries abound in the Christian faith. God has given His Word to the apostles and prophets. In His Word, He has revealed mysteries that are beyond our understanding. We may not understand them, we may not even like some of them, but we believe them because God has given them to us in His Word. The parables in today’s Gospel reveal two mysteries to us. The first parable teaches about the mystery of faith. The second parable teaches of the mystery of Christ’s Body, the Holy Christian Church. The first parable is about seed growing in a field. Modern scientists know a lot about how plants grow and mature from seeds, but back in the first century when Jesus told this parable, these things were mysteries. You threw the seed on the ground and after a while, it sprouted and grew and matured. How? No one knew. These things happened automatically without the help of the farmer. The farmer went about his regular business and the plants just grew. Even though we know how and why plants grow, the farmer’s job has not changed that much. We have more machinery to help with the work, but the basics are still the same. The farmer plants the seed, does what he can to provide a healthy environment with fertilizers and pesticides, but in the end, there isn’t a whole lot the farmer can do to force the seeds to germinate, grow, or mature. The farmer can provide a healthy environment for the seed to grow, but the growth itself comes from inside the seed just as it always has. 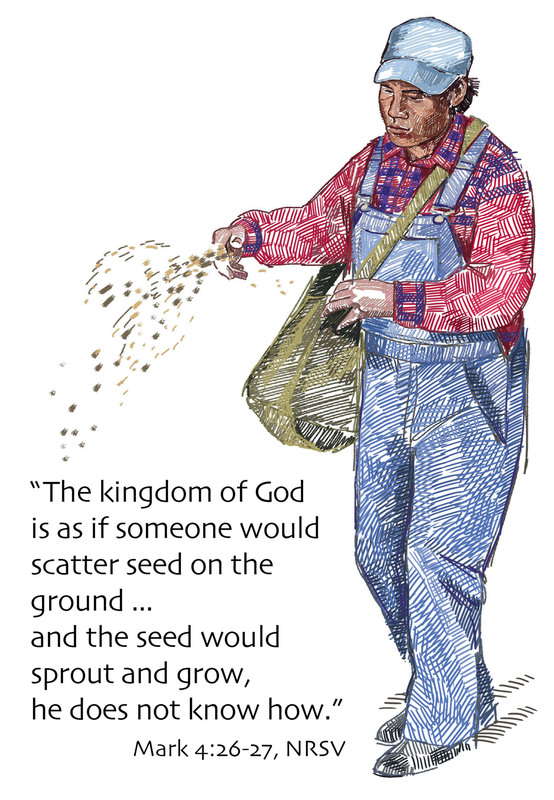 Mark 4:26 (ESV) 26 And [Jesus] said, “The kingdom of God is as if a man should scatter seed on the ground. Here Jesus wants us to compare the seed to the Word of God. The man who scatters the seed is anyone who shares the Word of God with others. When you confess your faith to other people, you are that man scattering seed. Every time I tell someone that I am a poor, miserable sinner who deserves punishment and then tell them how Jesus died on the cross so that I receive the joy of heaven instead of that punishment, I am that man scattering seed. These well-meaning teachers make us feel as though confessing our faith before others is like making a sales call. If nothing happens, we have failed to close the deal. Remember that the farmer is not responsible for making the seeds sprout or mature. In the same way, you are not responsible for producing faith in the heart of another. That is the mysterious work of the Holy Spirit. Too often, well-meaning teachers have told us that we must not only share our faith with others, but that we are somehow responsible for bringing those others to faith – that we are somehow responsible for the growth of their faith. These well-meaning teachers make us feel as though confessing our faith before others is like making a sales call. If nothing happens, we have failed to close the deal. Although these teachers are well intentioned, they can make us feel really guilty for seeds that we don’t see grow. Today’s parable tells us that this is a false guilt; the Kingdom of God doesn’t work that way. It tells us that the growth of faith in the soil of the heart is a mystery; it is not up to us, it is something that God does. This parable also teaches us that if no faith grows, it is not our fault. Just as I cannot cause a seed to germinate by giving it a pep talk, I cannot force faith to grow with anything that I do. It is the work of the Holy Spirit. This parable is a great comfort to us. From this parable, we learn that the pressure of converting someone to faith in Christ does not belong to us. God has reserved that for Himself. Just as the farmer scatters the seed out on the ground, God has given us the privilege of proclaiming the joy of our salvation. On the other hand, God alone is responsible for producing a crop of faith from that proclamation. So, what is the joy of our salvation? What proclamation do we throw out to the world? Jesus explains that in the Parable of the Mustard Seed. Jesus often compares Himself to plants. John 15:5 (ESV) 5 I am the vine; you are the branches. Whoever abides in me and I in him, he it is that bears much fruit, for apart from me you can do nothing. And again in John 12:23-24 (ESV) 23 … Jesus answered them, “The hour has come for the Son of Man to be glorified. 24 Truly, truly, I say to you, unless a grain of wheat falls into the earth and dies, it remains alone; but if it dies, it bears much fruit. Here Jesus speaks of His suffering and death – how He would die and – like a seed – grow up to bear much fruit. In today’s Gospel, Jesus once again tells us that He must be buried – planted like a mustard seed. This burial reminds us of the suffering and death He endured to take away all our sins. Jesus said, “a grain of mustard seed … is the smallest of all the seeds on earth …” Although He is God, Jesus became small by assuming a human nature. He became small enough to live in the womb of the Virgin Mary. He became small enough to live under the authority of the law and keep it perfectly. He became small enough to die a shameful death and be buried in a borrowed tomb. Like that grain of mustard seed, He rested in the ground. Jesus did not remain in the grave. Instead – as a mustard plant emerges from the ground – He emerged from death. Just as a mustard plant becomes one of the largest plants in the garden so also Jesus becomes ever larger – large enough to be known throughout the world. As a mustard plant fills a garden and is large enough to harbor birds so also Christ’s body – the church – grows to fill the earth. We are part of that mustard plant that is the Holy Christian Church. The Holy Spirit inspired Paul to write, Romans 6:3-5 (ESV) 3 Do you not know that all of us who have been baptized into Christ Jesus were baptized into his death? 4 We were buried therefore with him by baptism into death, in order that, just as Christ was raised from the dead by the glory of the Father, we too might walk in newness of life. 5 For if we have been united with him in a death like his, we shall certainly be united with him in a resurrection like his. Through baptism, the Holy Spirit joins us to Christ’s death and we become part of His body – the church. The wonderful part about belonging to the Holy Christian Church is that, no matter how often we sin – no matter how often we mess up, God has forgiven us for Jesus’ sake through the Holy Spirit’s gift of faith. He forgives us and calls us to follow Him. We can come together as the Body of Christ and continuously receive the forgiveness of sins. Even though your pastor is probably a worse sinner than you are, His words of forgiveness are valid. The words of forgiveness that come from his mouth are not his words, but Christ’s words. When that sinner whom God has called to be your pastor forgives your sins, it is not he who forgives. It is Christ Himself who forgives your sins. And I thank God that the words I speak are for me as well as for you. As part of Christ’s church, we not only receive God’s forgiveness through the mouth of the pastor, but also through our own mouths as Jesus Christ gives us His body and blood in union with the bread and the wine of the sacrament. Jesus Himself said, Matthew 26:27-28 (ESV) 27 … “Drink of it, all of you, 28 for this is my blood of the covenant, which is poured out for many for the forgiveness of sins. What a gift this is that we receive as members of the Holy Christian Church. Previous Article Who is God? Next Article Who is this guy?